the doors to the magical world of Pinocchio. communal games and download exclusive content unavailable to general DVD owners. * Disney BD-Live Network features only available in the U.S.
Disney BD-Live Network – The Disney BD-Live Network is just one of the many ways movie lovers, families, and loved ones can continue to stay connected and engage in their favorite movies. Movie Chat – Communicate with your remote friends on-screen while in a synchronized viewing party using your remote control or any text enabled device such as a laptop, desk top or any PDA device such as a Blackberry, iPhone or most other regular cell phones. Your chat session will appear over the movie and occur in real-time while watching the movie together. Movie Mail – Blu-ray owners will be able to record a personalized video message of themselves, superimpose that capture onto one of many pre-selected clips of the movie, and send it off to a friend, colleague, or relative. Movie Challenge – Users will be able to test their skills against other players in a synchronized, real-time, online trivia game while watching Pinocchio with anyone online. Movie Challenge is always active no matter what time of the day it is, and there will always be a game in progress. 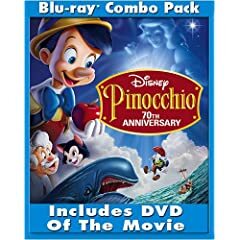 Disney Movie Rewards Live – Pinocchio Blu-ray owners will be able to accumulate Disney Movie Reward Points by participating in many Disney BD-Live Network activities. In return, viewers can redeem points for exclusive content such as Avatars, downloadable extras, and many more exciting possibilities. below. Last date for entries is March 14, 2009.